Behold, the sea unicorn. Before the Age of Discovery, most Europeans knew little of the non-human creatures that shared their planet. People still believed that unicorns - those of the equine variety - existed, and the Vikings capitalized on the myth by slaughtering sea unicorns in the North Atlantic and selling their tusks to wealthy Europeans, who were none the wiser about the con. Unlike terrestrial unicorns, sea unicorns actually exist, only today we know them as narwhals. It wasn't until 1577 that an English explorer named Martin Frobisher laid eyes on them. In the intervening years, we've learned a lot about the horned whales, but we still don't know very much about why their faces have long, pointy swords attached to them. Here's what we do know: their horns are not horns at all, but overgrown teeth. The ideas scientists have put forward over the years have been legion. The list includes–but is not limited to–an acoustic probe, a means for dumping extra heat, a rudder, an ice-picker, and a spear for battling predators or perhaps other narwhals. Most of those ideas emerged not from close observation but speculation. The narwhals live in remote Arctic fjords and vanish for the winter under the ice. They do not make it easy for scientists to see them use their tusk for anything at all. Now, a group of researchers from Harvard, the Smithsonian, the University of Minnesota, Fisheries and Oceans Canada, and elsewhere have conducted an experiment with wild narwhals to see whether their tusks might be sensory organs. One hint that this might be the case is that, unlike our teeth, they're not coated with enamel. Instead, they seem explicitly designed to bring seawater close to the nerve endings within. To see if the narwhals used this intricate anatomy to sense their surroundings, Nweeia and his colleagues captured live narwhals off of Baffin Island and slipped a conical jacket over their tusks. The scientists then pumped water into the jacket, either with a high or a low level of salt. Electrodes that Nweeia's team put on the skin of the narwhals measured their heart rate through the experiment, which only lasted less than half an hour per animal. They found that the narwhals' heart rate changed according to the salinity of the water their tusks were exposed to. 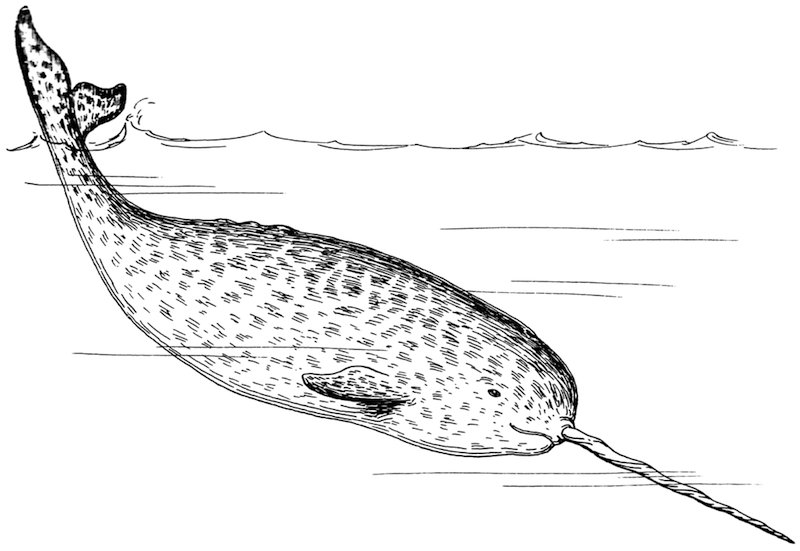 Could narwhals use their tusks as sensory probes, perhaps to identify possible mates, or to track down their friends or family? Nweeia and his colleagues suggest that the males may use it to sense things that can help them win mates. They may be able to track down female narwhals by sampling the chemicals in the water, searching for the ones found where the females feed. They might even be able to sense whether females are receptive for mating from the chemicals they release. Some males might be able to use their tusk to find food for newborn calves. Males with more sensitive tusks would have better luck at reproducing than others, and that difference would drive the evolution of the wildly elongated tusk. That the tusks only grow on males already hints at sexual selection as the mechanism behind their evolution. But this research suggests they're more than ornamentation (like the peacock's tail) and more than a weapon (like a deer's antlers). Whether they initially evolved as a sensory organ though, or if that ability came later, is still unclear, especially since males have been observed "tusking," while nearby females look on. The tusks probably serve multiple purposes in a narwhal's daily struggle for survival; we may never know how the narwhal got its tusk in the first place. The entire post is awesome. Head on over to Phenomena to read the whole thing.